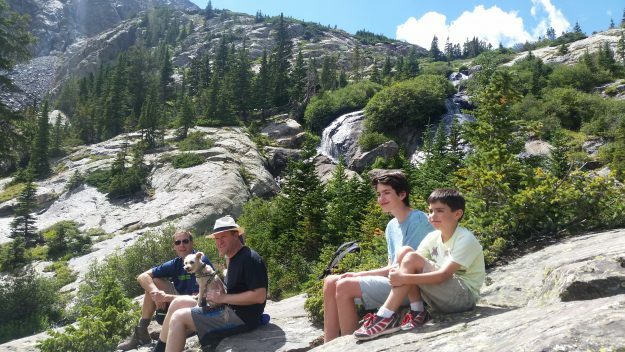 Colorado governor-elect and curretn U.S. Rep. Jared Polis, his dog Gia and several constituents relax and admire the views in his proposed Continental Divide Recreation and Wilderness area near Quandary Peak in 2016 (David O. Williams photo). Colorado, dubbed “The Hate State” 26 years ago with the passage of the discriminatory, anti-gay-rights Amendment 2, on Tuesday night became the first state in the nation to elect an openly gay man to be its governor as Democrat Jared Polis topped Republican Walker Stapleton. Amendment 2 was deemed unconstitutional by the U.S. Supreme Court in 1996, but Colorado has remained a battleground over LGBTQ rights with the recent SCOTUS decision siding with a baker who refused to make a wedding cake for a gay couple. And closer to home, “bias-motivated” bumper stickers in Eagle and Vail targeted Polis in his run for governor. Polis, an entrepreneurial millionaire who for the last decade has represented part of Eagle County in Congress, defeated former Colorado Treasurer Stapleton by a margin of 52 percent to 45 percent with 84 percent of the precincts reporting. And Colorado voters recorded another first in Polis’s former congressional district, electing the first African-American from the state to Congress. Democrat Joe Neguse was beating Republican Peter Yu by a margin of 60 to 34 percent with 86 percent of the precincts reporting. Neguse will now represent the state’s 2nd Congressional District, which stretches from eastern Eagle County – including Vail – down to the northern Front Range cities of Boulder and Fort Collins. The western two-thirds of Eagle County, along with most of Colorado’s Western Slope and the southern Front Range city of Pueblo, will continue to be represented by Republican Scott Tipton, who held a 52 to 43 percent lead over former state Rep. Diane Mitsch Bush, a Steamboat Springs Democrat, with 93 percent of the precincts reporting. But overall, Democrats regained a majority of congressional representatives with the defeat of Republican Mike Coffman in the 6th Congressional District in Denver’s suburbs. Democrat Jason Crow was leading Coffman 53 to 44 percent with 88 percent of precincts reporting. Crow’s win was part of overall Democratic retaking of the House of Representatives nationally. Colorado Democrats also appear to have retaken the majority in the state senate, with women leading the charge. Vail’s own Democratic Sen. Kerry Donovan was leading Republican Olen Lund 60 to 40 percent with 95 percent of precincts reporting in the seven-county Senate District 5 that includes Eagle County. The Democratic majority in the state house was likely to grow, including a victory by Democrat Dylan Roberts of Eagle, who was topping Republican Nicki Mills of EagleVail by a 61 to 37 percent margin with 96 percent of precincts reporting in House District 26, which includes both Eagle and Routt counties. “I am beyond humbled and very honored that the voters of Eagle and Routt counties have entrusted me with the task of serving them in the State House,” Roberts told RealVail.com Tuesday night. “We have a lot of work ahead of us, particularly on the issues of lowering health insurance costs and protecting our environment. Democrats also dominated down-ballot state offices from attorney general (Phil Weiser) to secretary of state (Jena Griswold) to treasurer (Dave Young). “We in Colorado have a unique opportunity to be a model for our nation during a challenging time,” Weiser said in a prepared statement. The hard issues we can confront—building an inclusive Colorado, managing our water in the face climate change, addressing the opioid epidemic, and providing accessible and affordable health care, to name a few—are challenges that are not being addressed in Washington. Locally, the only contested Eagle County race saw incumbent Democratic Eagle County Commissioner Jeanne McQueeney leading Republican Jacqueline Cartier 62 to 37 percent with more than 55 percent of the votes counted. And Eagle County Ballot Question 1A to continue an open space tax was leading 81 to 18 percent. In Avon, Chico Thuon (889), Tamra Nottingham Underwood (730), Scott Prince (705) and Sarah Smith Hymes (701) appeared to be the top vote-getters in a hotly contested town council race. For the latest Eagle County election results, go to the Clerk and Recorder’s website.